Department of Housing and Urban Development offers questions and answers about reverse mortgages, with a search for Home Equity Conversion Morgage. Washington state Department of Financial Institutions provides regulatory oversight for the state’s financial service providers. At www.dfi.wa.gov, the department provides a reverse mortgage overview. AARP has multiple articles and resources online at www.arp.org under reverse mortgages. Legal experts still advise caution, but reverse mortgages are showing a mild resurgence both regionally and nationally. As baby boomers age, the trend could grow. Some seniors consider them when cash poor and house rich, or against medical costs, if they’ve built equity in a home. Still, issues can emerge for them and heirs, so it pays to read the fine print, said Julia Dooris McGann, state assistant attorney general in the consumer protection division. A reverse mortgage is a type of home loan allowing homeowners who are 62 or older to access the home equity they’ve built up and defer payment of the loan until they die, sell or move out. If approved, homeowners borrowing against equity take the cash in a lump sum or as monthly income, as a line of credit to tap when needed, or a combination. “The bottom line is, it’s not free money,” McGann said. She spoke recently in Spokane to the group Vulnerable Adult Links United. Money gained isn’t free because the loan balance grows over time and must be repaid eventually, she said. Other costs can be similar to a regular mortgage such as origination fees, closing costs, interest charges, and sometimes a loan service fee and mortgage insurance premiums. The U.S. Department of Housing and Urban Development tightened lending criteria for reverse mortgages in recent years. Changes require that lenders determine whether would-be borrowers have enough income to keep up with property taxes and homeowners insurance so they don’t default on the loan and, possibly, lose their home. Many people who get reverse mortgages do so because they’re strapped for monthly income and want to stay in their homes, said Jack Tenold, a Spokane branch manager for Caliber Home Loans. If a loan amount comes due because of death or a move, he said he’s found that most banks work with families. Tenold says another kind of reverse mortgage borrower might be a professional who just turned 62. Some younger seniors would rather have it arranged as a line of credit that grows over time and is tied to the course of interest rates, with unused portions converted to monthly income years later. Others might need immediate cash for a specific reason. Money received is usually tax free, McGann said. Some TV commercials can make reverse mortgages sound like they solve all problems, McGann said. In December, the Consumer Financial Protection Bureau took action against three reverse mortgage companies for deceptive ads, including claims that consumers couldn’t lose their homes. The CFPB ordered American Advisors Group, Reverse Mortgage Solutions, and Aegean Financial to cease such advertising practices, implement systems to comply with laws, and pay penalties. AAG commercials often depict actors Tom Selleck or Fred Thompson, two people who portrayed TV characters in positions of trust, a police commissioner and district attorney, McGann said. Understanding a reverse mortgage’s terms is what really matters, or people should consider having a real estate or estate planning attorney read over legalities, McGann said. Some conditions allow a homeowner to move into a care facility for a certain number of months without requiring repayment, if the home is looked after, she said. In most cases, an eligible spouse who is younger also can stay in the home if the other spouse dies, depending on terms. She cautions people also should realize they still have to pay home-related costs, including property taxes, insurance, utilities and property maintenance. Adult children might end up resolving issues. “It seems people will go into them hoping they’ll have extra cash in later years, but they end up working a hardship upon their heirs,” McGann said. People arranging estate matters consider equity in a home as part of what is passed on after someone dies, said Michael Whipple, of Whipple Law Group in Spokane. “Among general concerns I have about a reverse mortgage is you lose all your equity,” Whipple said. 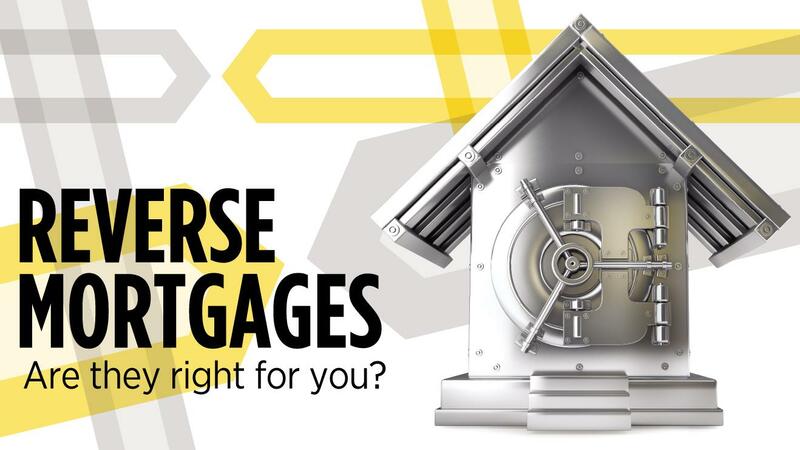 Generally, some homeowners might consider reverse mortgages as they face costs from aging in place and look for potential ways to qualify for Medicaid. But Whipple cautioned that people should do their financial homework about those options, as well as consider other lending vehicles. The loan amount has to be paid back, or the institution that did the lending would sell the home to get money owed, he said. What is the rate, and calculation of all costs? How does that compare to another financial vehicle such as home equity loan or line of credit? What happens after you die or for a spouse to remain? McGann showed the VALU group a 2016 news segment about a case in Florida, when the daughter of deceased parents who had a reverse mortgage got named in a foreclosure and received attorney letters and calls. However, the bank had made a mistake and should have taken over ownership before the home sat empty, property value declined, and it went into foreclosure. “So things can go very, very wrong,” she said. If the woman had contacted the bank and made sure the home was sold, she might have received a portion from the sale long before the value declined. Home sale proceeds beyond the amount owed belong to a spouse or estate, which means any remaining equity can be transferred to heirs, and no debt is passed along to the estate or heirs, HUD information says. If someone suspects any questionable lending practices, McGann said people can file a complaint online at www.atg.wa.gov. People can locate a FHA-approved lender or find information to contact a counselor by going online at www.hud.gov and searching under Home Equity Conversion Morgage. AARP also offers information on its website. at www.aarp.org, with a search for reverse mortgages. Published: March 5, 2017, 7 p.m.